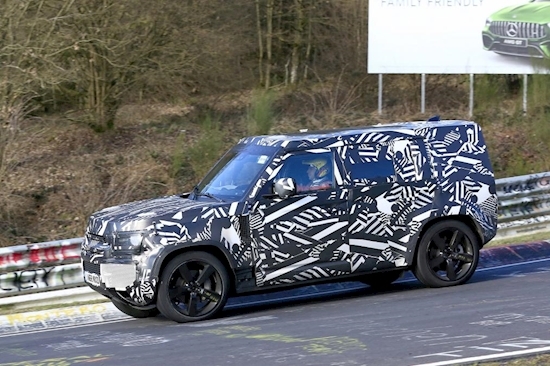 The eagerly awaited next-gen Land Rover Defender has been spied testing again, ahead of its official debut. Rather than proving its off-road credentials, a prototype has been seen lapping the famous Nurburgring racetrack in Germany. When it arrives next year, the new Defender will rival the Jeep Wrangler and be priced from around £40,000. Jaguar Land Rover has an engineering base close to the Nurburgring race track, which was likely being used to continue the car’s stress testing. The new spy images don’t give many further clues as to the new Defender’s styling, but they do offer a hint about the new car’s dimensions. There has been intense speculation on how the next-generation Land Rover Defender will look and these spy shots give the clearest glimpse yet. While its disguise has made an effort to mislead the eye and square-off certain edges, what can be seen is a silhouette that stays faithful to the proportions of the original model. Previously, the Land Rover Defender was spotted undergoing cold-weather testing under a heavier disguise. Now, though, we can see more of what to expect when the new car arrives. Seen here with five doors – as per the original 110 model – the new Land Rover Defender looks to be similar in size to the Land Rover Discovery albeit with a more traditional two-box shape. The car’s disguise completely covers its bonnet, which has been flattened off and left with a sharp leading edge, while large padded sections around the rear windows hide the precise details. An upright windscreen, side-opening rear door, flared wheelarches and tall ride height all hark back to the original Defender, while the car’s short overhangs and tucked-away exhaust look like off-road-friendly features. Square headlights can also be seen, rather than the original car’s round items. It’s likely that the Defender will carry a look that fits in with the rest of the range, rather than being an out-and-out retro design. The long-running original Defender is regarded as a design icon, and creating a worthy successor is no easy task. Far more emphasis is placed on brand identity today than was the case when the original car was in production, and the next Defender will be charged with being recognisably a product of Jaguar Land Rover, while maintaining its individual appeal. Earlier this year, an image leaked online allegedly showing the interior of the new Defender. It has since been deleted, but did show what is claimed to be the full dashboard design, including a large infotainment screen, a digital dial cluster and a rugged looking multi-function steering wheel. The picture also suggested that the Defender could potentially come with a row of three front seats, and a set of pedals marked with “GO” for the accelerator and “STOP” for the brake pedal. However, Land Rover has assured Defender fans that its successor's off-road ability will make it worthy of the name. JLR executive Dr Ralf Speth told Carbuyer that the design and engineering of the new model is all but finalised, and promised that the new model will be “even more capable” than the previous Defender when the terrain gets challenging. Precise mechanical details have yet to be confirmed, but the next Defender is likely to share more parts with other Land Rover models than the original car did. Aluminium construction is expected, possibly using a rumoured MLA (Modular Longitudinal Architecture) platform that could also serve as the basis for other Jaguar Land Rover vehicles. This would also make it simple to introduce a wide range of Defender variants. Although the Defender has always been famed for its simple, rugged engineering that can shrug off harsh terrain, Jaguar Land Rover certainly won't overlook the booming market for luxury SUVs. JLR design boss Gerry McGovern said: “The Defender is all about durability – that indestructible, durable vehicle which is what a family of Defenders would be.” However, he made strong hints that high-performance SVR versions could be offered. Development versions of the 2020 Land Rover Defender have been powered by a 2.0-litre diesel engine, according to their registration information, while other prototypes have been petrol powered. Land Rover has confirmed that all of its production models from 2020 will be electrified, leading us to believe that each powertrain at launch will feature a 48-volt mild-hybrid system helping to reduce CO2 emissions and increase fuel economy. Jaguar Land Rover has stated previously that the Defender will have a "balanced engine portfolio", hinting that several engine options will be available. With Jaguar Land Rover’s Special Vehicle Operations (SVO) division having already impressed with models like the 567bhp Range Rover Sport SVR, it could turn its attention to the next Defender and produce a real rival to the new Mercedes-AMG G63 SUV. Such a car would likely prove popular in the growing Russian and Chinese markets, as would a luxurious version along the lines of the Range Rover SVAutobiography. Previously, a spokesperson from Jaguar Land Rover told Carbuyer that: "Jaguar Land Rover runs a wide range of engineering and technology development programmes. We are unable to comment on the specific nature of these programmes. However, we can confirm that the Defender programme is progressing well and has reached an exciting stage of its development. “We can confirm that customers around the world will be taking delivery of and enjoying Defender again from 2020." Carbuyer expects the new Land Rover Defender to break cover midway through 2019, with sales starting towards the end of the year for delivery in 2020. Want to know more about the Land Rover Defender? Read our full review, or see how it compares to the best 4x4s and SUVs you can buy in 2019.